The UK has had a cold spell, correctly predicted by the Global Forecasting System (of which many forecasters may have initially scoffed at)...but the cold weather from the East has made its way across to the UK. 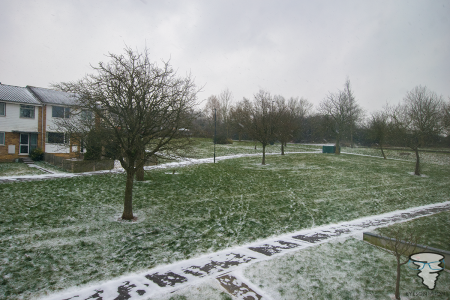 The South East and Northern parts of England have already seen substantial snowfall and, as usual, the snow has failed to make a full appearance here in Bristol. That said, this cold weather is due to meet the low pressure system, known as Storm Emma, this afternoon and further chaos due to the weather is predicted in our area. Unusually, we are under an Amber Warning for snow and ice in this area, which means we need to make preparations for severe weather. Our warning can be seen below (Credit: The UK Met Office). The weather isn't just going to affect our region either, with multiple weather warnings in place across the UK. 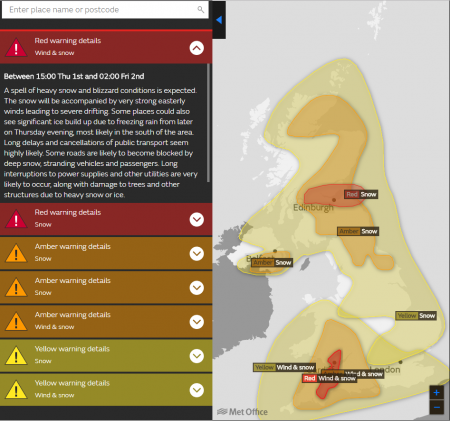 There are two red warnings also in effect, with central Scotland and even other parts of the South West of England and Wales with the "Take Action" Red Warning in effect. The media will be very interesting to review over the next few days and hopefully people will heed to warnings to minimise loss of life. I include an image from the UK Met Office showing all the warnings in effect. It has also been noted that the weather does like to draw shapes with its varying intensities (it's that or the people who draw the warnings on the map like to get creative!). Scotland has its very own Nessie warning! This is not the only time where us weather geeks have spotted shapes in the forecasts, with the Storm Prediction Centre also drawing odd-shaped areas of danger! So that is the current update on the Beast from the East/Storm Emma - I hope to keep this blog updated with changes - even if nobody reads it - for personal record! Keep warm, stay safe and enjoy the views of the winter wonderland!